Julia Child, who would have celebrated her 100th birthday on August 15, 2012, was a pioneer in bringing French cuisine to Americans at a time when most people were content with white bread and TV dinners. But before she rose to prominence, she had served in the OSS during World War II and experienced the life of a Foreign Service spouse when she married Paul Child, who served in the U.S. Information Agency (USIA). Below are excerpts from a brief 1991 oral history in which she discusses her love of French cuisine and the ugly shadow of McCarthyism, including the notorious trip made by Roy Cohn and David Schine in 1953 to USIS libraries in Western European countries. The two reported that over 30,000 books, including works by Herman Melville, John Steinbeck, and Henry Thoreau, were “pro-communist.” The State Department immediately ordered thousands of books removed. Go here to read her entire oral history. 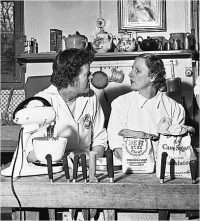 To listen to the entire interview, go to the ADST channel on Or you can listen to the Julia Child ADST Oral History podcast. And of course, you have to check out Dan Aykroyd’s (in)famous Julia Child skit. When I was in the Foreign Service, they didn’t really pay attention to wives at all. A lot of them never learned the language, or did anything….We were in World War II, we were in the OSS [Office of Strategic Services] and we met in Ceylon, or Sri Lanka, it was Ceylon then. Then we went up to China and we were there when the bomb dropped. Then we came back to Washington and Paul’s OSS Department — they called it visual presentation, maps, diagrams, war rooms and things like that — became the U.S. Information Agency. So we were there in Washington. Paul had spent a lot of his young manhood in France and spoke beautiful French, really practically bilingual. When they were setting up the USIS [United States Information Service] in Paris, he was asked to go over, which was of course wonderful for us. Outside of the Far East, I had only been to Tijuana (Mexico). And I had had French all of my life, but when I got over there I could neither speak it nor understand it. So I went to Berlitz two hours every day. And then we had some friends from New Haven who were medieval art historians, and they introduced us to their colleagues in France…. We said that we would meet every Monday for an exchange of lessons, but of course it turned out to be entirely French. They had medieval Wednesday evenings and Paul and I always went to them and everything was in French, which was good. There would be long, long discussions about whether the false transepts had been built in 1123 or 1131, and things like that. But that was wonderful just to be drowned in French. And then, I had never had French food before. I loved the Chinese food, it was just delicious. And I just fell in love with French food from the first bite. We came over, I think it was on the SS America with our old blue Buick, and our first French meal, or my French meal was in Rouen and I never, never turned back after that. After we had gotten settled [the Childs rented “a comfortable third-floor apartment on the Rue de l’Université behind the Chambre de Députés. Paul could walk across the Pont de la Concorde to his office…”], I enrolled in the Cordon Bleu [the French cooking school originally founded to give orphans a profession] and I was fortunately able to join a group of GIs on the [GI] Bill of Rights and we had a wonderful old chef [Max Bugnard] who had trained under Escoffier and was a real classicist and a wonderful man. We would start at seven in the morning and cook until about eleven. Then I would rush home and cook Paul a fancy lunch and go back again. I think it was the Cordon Bleu that helped me a great deal also because that was all in French. Q: And you were the only woman in the class? CHILD: I was the only woman in that class with the men. I just became passionate, I had been looking for a career all my life. I wanted to be on the New Yorker or something like that. Well, this was it. I was passionately interested in it, the tremendous care that all the chefs and teachers took. It was art for art’s sake. It made no difference how long it took. If it came out beautifully, that was it. That was very appealing. After I had been to the Cordon Bleu, heavens, [after] about six or eight months, it began repeating. You can just do a chaud froid [fowl or game cooked as a hot dish, but served cold]. Well, about the third time you feel that, you have had it. Luckily at that time I had met my French colleague, Simone Beck. Of course that was ’48-’49 and all of the Americans [in France] could hire servants for practically nothing. And the French bourgeoisie all had their little femmes de ménage, and I was so enthusiastic about this profession, but there wasn’t anyone to talk to of my own type. We had mutual friends who introduced me to Simca, as she was known, and Jean at a cocktail party and we literally embraced each other immediately because she felt the same way about, “Whom can I talk to!” She had a colleague, Louisette Bertholle, and the two of them were working together on a book on French cooking for Americans. They had a collaborator who died. I was delighted with that. So we started our cooking school about the next day and we called it the École des Trois Gourmandes, the School of the Three Hearty Eaters. That really started us seriously. Then their collaborator died, and that pleased me very much. I never knew him. Good timing. So we started in on our book together, and that took a long gestation period. It wasn’t done until our last post in Norway, which was in ’59. When we got to Oslo there was an American Women’s Club and I remember the first luncheon I went to, which would have been in probably ’59. It was a typical ladies’ luncheon. They had a salad made out of Jell-O, I guess, and it had bananas and grapes and marshmallows and it was shaped — and really it looked like a phallic symbol! It was sitting on a little piece of lettuce, you couldn’t hide it under anything. Then it ended with one of those cake mix cakes with a white mountain of coconut frosting. Horrible! And some of us got together and said, “Never again!” So we had a cooking committee so we couldn’t end up with anything like that again. I gave cooking lessons there in Norway with a mixed — Norway was an awfully nice post. Oslo, we just loved it. So many nice people and then of course they all spoke English. Even though you were learning Norwegian, so it was very easy to get along with them, and they are such nice people anyway. So we loved our last post. After Norway, Paul had said that when he was sixty, he was going to retire because he never really liked the bureaucracy at all. And so we left when he was sixty, and that’s when my book [Mastering the Art of French Cooking] came out. And he helped me with all of that. He helped me with proof reading and the index. He’s a wonderful photographer, so he did photographs from which we had a sketch artist do drawings. So it was wonderful having him. Q: He was very supportive, wasn’t he? Q: And also, to be able to go from your lessons to all of the delightful little restaurants around Paris. CHILD: Yes, and what was wonderful. Those were the days of the classic cuisine, and it was so good. It was delicious. Just a plain roast chicken was so good. That was before they had learned to do battery raised chicken. They really tasted like chicken. And delicious vegetables and salads and cheeses, and so forth. Q: While you were learning at class, you must have gone to little restaurants. CHILD: Oh, in the old days, I think Paul’s salary was $6,000 and I got $100 a month from my family. But we had envelopes, and we each had $2 a week allowance, and we had everything budgeted out and we very carefully saved everything for going out. But even so we could go out two or three times a week, and even a great restaurant like the Grand Véfour was only about $3.50. Or was it $10? I think maybe it was $10. But you could eat beautifully for a reasonable price. But we had to watch every penny. When it broke, we were in Marseilles. 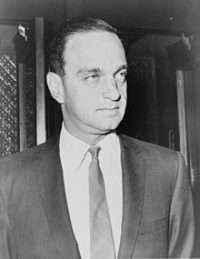 During the McCarthy thing we were in Marseilles, and when [Roy] Cohn and [David] Schine [reference to an infamous European trip made by McCarthy’s two bullying assistants] came through, I think we were still there. We went up to Paris shortly afterwards and I remember our cultural attaché, Larry Morris — he was an older man, I guess he was in his fifties. They [Cohn and Schine] had arrived in Paris and of course they went out to all the nightclubs and so forth, and it happened to be during Easter, and on Easter Sunday they had called a meeting that everyone was to get there at eight o’clock a.m. at the USIS office. Of course, they didn’t appear. It turned out that when they finally got hold of them, they were sleeping off a night at Montmartre. They had ruined everyone’s weekend. I remember they were charging though the USIS and Larry Morris came in and saw Cohn sitting at his desk with his feet on his desk. Larry Morris said, “Get out of that chair. Get your feet off my desk.” But most people were scared to do anything. They were also the kind of people that if you really came at them, they would back right off. But most people didn’t dare. I remember Allen Dulles [Director of the Central Intelligence Agency in the early 1950s], as I was told, when they wanted to investigate the CIA, he said, “If you are going to investigate anyone, you can investigate me.” They never touched him. And you must learn the language. In those days, before we went over to Germany — In those days it was all slots and bodies — you got someone who was a Cultural Affairs Officer who had the mind of a mechanic, who knew nothing, didn’t speak the language. 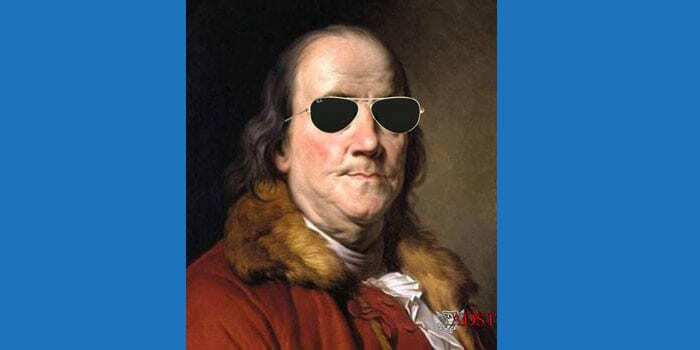 I think that was regrettable, because when you think of the Russian heyday, they had to learn various languages and I think that in the Foreign Service you should have two major languages and two minor ones. You should really concentrate on those things so that when you send somebody over they could go right in and talk. Because what good are you if you can’t talk to the people. Absolutely none. I think maybe now that we are not top dog, we may begin to take things a little more seriously. I think we always thought that we were so wonderful and that everyone could learn English. We had a very interesting and good time. Of course if you want to make money you don’t go into the diplomatic service. But it is a fascinating time. You were in Sierra Leone and all those places. I think if we had stayed in longer we probably would have ended up in deepest Africa, I’m sure. Q: We ll, maybe one post there, who knows. Your husband sounds like a very interesting man. CHILD: Black belt in judo, and photographer and painter. He was not a bureaucratic man. What he liked to do was have his work and do it. And he was never ambitious. I know there were some of them in the Paris embassy who would go in on Sundays and Saturdays, busy work, so people could see they were there. Paul left as soon as he could leave, and did his work, and he just didn’t get into the politics of the bureaucracy at all, so he never rose very far.